The Jackson Hole Kiters go over the 2015 snow specific kites for 2015. -The Access is now the top choice for beginners, intermediates. Experts will choose the small sizes for technical situations in strong winds due to the stability and predictability. Equipped with the reride the access now is an even better high wind mountain tool. -The Ozone Frenzy is entirely new for 2015 with ribs supporting the leading edge, no mesh covering over the cells, and internal strapping all adopted from paragliding technology. 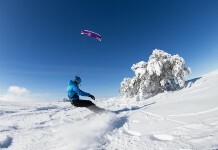 The Frenzy is the do it all performance snowkite for climing, freestyle, wakestyle and more. The kite has a higher performance feel at the bar with very controllable stall control, with a noticeable increase in stability for 2015. 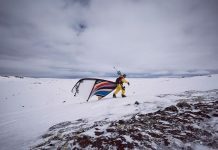 -The Summit is the high performance mountain kite for the experienced snowkiter looking for a higher aspect high performance kite. The Summit boosts huge and glides great, it continues to be a favorite for bar feel and speed. -The Chrono is Ozone’s dedicated race kite. It’s design is specific for efficiency in racing and is not designed for the mountains. It’s closed cell so it can be used on water, has plastic ribs and is ultra high aspect in design. -The Ozone bags are the best ever for 2015, strap skis or snowboards easily to the outside for hiking. The packs have a principal back country pack design and are perfectly sized for kites. The new Kompressor sack is perfect for easily getting a kite to it’s minimal size for packing multiple kites. The Jackson Hole Kiters are proud to continue working with Ozone Kites. We’ve experienced the support and design considerations that Ozone is continually perfecting. 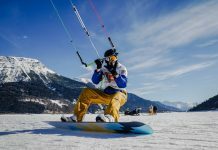 Ozone benefits from paragliding, speedflying, kitesurfing, and snowkiting technology to move design forward and continually increase performance. Articolo successivoKitesurf crash compilation 2014!! Aiuto! !